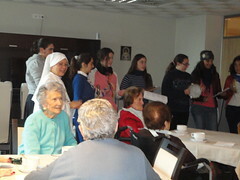 This past December 28th, we had a get-together for young girls in Alcalá de Guadaíra. 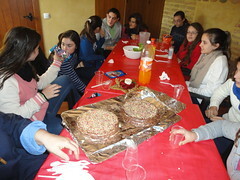 10 girls came, 4 from the town "Dos Hermanas" and 6 from Alcalá de Guadaíra. We began at 11:00 a.m. by preparing the dough for some delicious waffles and a chocolate cake, since it was one of the girls' birthday. While we made the waffles and cake, we practiced Christmas songs. Around 12:00 we had a time for prayer in the Shrine, contemplating the manger. Sister Ruth spoke about the poverty of this Child, of his obedience, talking about where we have our heart placed, and the importance of living for the Lord. If we truly believe it must be seen in our life and with our life. After a time of personal prayer in silence, we went down to the plaza where the women of the Home of the Mother had a stand with all the objects that they make to sell them and help the needy families and the missions of the Home in Ecuador. We returned at 1:30 and set the table to eat lunch. We were already hungry! We talked for a long time after lunch in a friendly environment, laughing alot. 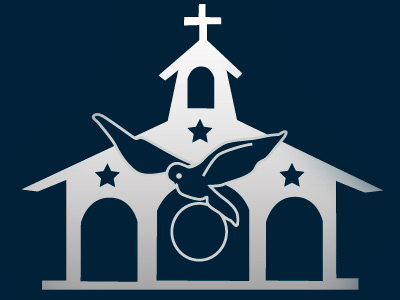 Once we cleaned everything up, we divided in two teams to play a religious trivial game for 45 minutes that was invented by the sisters, which put to the test the religious formation of those who dared to play. Who knows advances! And it was quite the combat between the two teams. The sisters could not give the answer but they could give some hints. Everyone wanted to play again. At 4:50 we made trips with the car to the new elderly home that has opened here in Alcalá to visit, sing Christmas carols and bring them the delicious waffles that we had made that morning. We had already devoured the cake after lunch. It is a satisfaction to be able to bring joy to these elderly who are so in need of care and company. We returned around 6:30 and had a meeting to analyze the day. The girls understood how much mankind needs to be loved after their experience with the elderly, and understood that, even though they have all the riches of the world, if they don't have anyone that cares for them, it doesn't serve for anything. They would just have a deep loneliness in their heart that would make them suffer greatly. This sadness was seen in many of those elderly men and women. The girls left at 7:00 p.m., happy for the day that they had spent and with the agreement to continue making more visits to other elderly homes or to the sick, to make thigs to sell with the women in the market place and earn money for needy families and the missions, and to help the sisters to prepare the get-together each month with the little girls. We hope that all this is not forgotten! Thank you Lord for everything.